This year Vesak Day falls on Friday, May 28, 2010. Sometimes called “Buddha’s birthday,” it actually encompasses the birth, enlightenment (Nirvana), and death (Parinirvana) of Buddha. It is a public holiday in many countries throughout Asia as it is the most important date in the Buddhist calender. Huge crowds gather in and around the various Buddhist temples in Singapore. I have not yet managed to visit the temples to witness the freeing of birds or monks chanting sacred hymns, so I hope this year we can manage it. There are a few Buddhist temples where people will congregate to attend meditation sessions, religious services and prayer meeting, and some are more spectacular than others. Probably the most famous Buddhist temple in Singapore is the Lian Shan Shuang Lin Temple at 184E Jalan Toa Payoh (tel: 6259 6924). This temple is a national monument and dates back to 1908. You reach the temple via an elaborately decorated gateway and over a bridge, which opens into a beautiful courtyard. Another temple to visit is the Buddha Tooth Relic Temple at 288 South Bridge Road in Chinatown (tel: 6220 0220). Here there will be Bathing Buddha Ceremonies, Vesak Day food offerings, where auspicious vegetarian meals are offered to Buddha, Dharma and Sangha, and blessing ceremonies throughout the day. 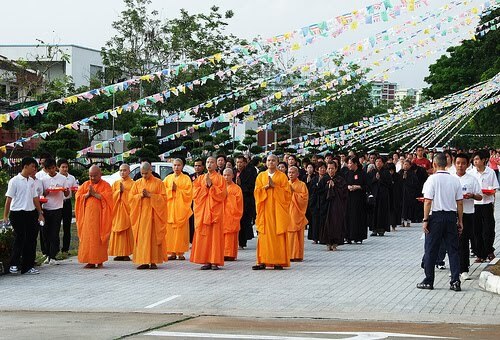 Other temples to visit are the Buddhist Lodge at 17 Kim Yam Road, off River Valley Road, the Thai Temple at 150B Jalan Bukit Merah, the Kong Meng San Phor Kark See Monastery (KMSPKS) at 88 Bright Hill Road Bishan (tel: 6849 5333), where there will be a vegetarian food fair, a recycling jumble sale as well as an exhibition on environmental and vegetarian awareness. For an interesting explanation on Vesak Day and its significance for the Buddhist community, you can visit the Singapore Tourism page. Enjoy your day whatever it holds for you.